The US Open begins next week celebrating 50 years of Open Era tennis with a decidedly new feel at the Billie Jean King National Tennis Center in Flushing Meadows. The biggest change in the infrastructure of the sprawling complex in the New York borough of Queens will be the unveiling of the new 14,000-seat Louis Armstrong Stadium. Designed to give a more "intimate" feel than the cavernous Arthur Ashe stadium, the new Armstrong with its retractable fabric roof "gives the US Open a second stage that is second to none", USTA President Katrina Adams said this spring as construction neared completion. "(It allows) us to present a reliable and predictable schedule that will be unaltered by weather. Now, with two stadiums with roofs, you know that if you've got a ticket to the US Open, you're going to see tennis regardless of the weather conditions." The Armstrong design, with terra cotta louvers that aid air circulation, features 6,400 reserved lower-bowl seats and more than 7,000 seats in the upper bowl that are open to anyone holding a grounds pass -- a link to the days when grounds pass holders flocked into the old Armstrong before it was demolished after the 2016 tournament. On all courts, however, it's the 'shot clocks' that will be in use for the first time in a Grand Slam main draw that will undoubtedly be most visible. The clocks, designed to prevent time-wasting and maintain a regular pace of play, have received mixed reviews from players in North American hardcourt tournaments leading up to the Open, and the pressure-cooker atmosphere of a Grand Slam could intensify feeling on the subject. US Open tournament director David Brewer told the New York Post that the clocks are a bid to be "transparent with the players and the live and broadcast audience between points". "We want to get the information of the rules out there," Brewer said. The clocks, which will be placed at two corners of all four show courts and 13 field courts, will count out the 25 seconds a player is allowed to serve -- time previously kept by the chair umpire. Andy Murray, the 2012 US Open champion, has welcomed the change. "It was one of those things in tennis that is so stupid, that the players were sort of expected to be counting to 25 in their heads, not having a clock on the court, and then getting warned -- how were you supposed to know how much time you were actually taking?" Murray said after playing with a clock in Washington. But Serena Williams, who counts six US Open titles among her 23 Grand Slams, found the clock distracting in San Jose. "I hate it, because I serve way faster than the serve clock, and then I feel like I need to play slower -- which is totally not the case, obviously," she said. "I just have to not think about it because my game is a lot faster than the serve clock." 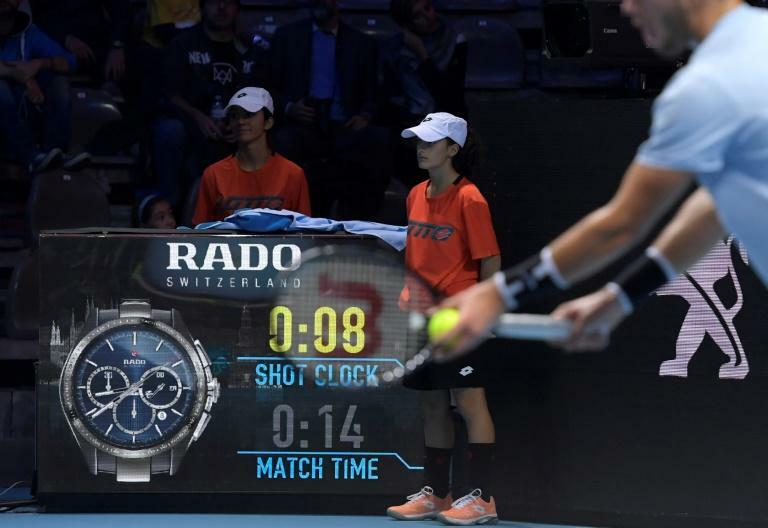 The clocks will also monitor warmup times, with the players having one minute to come to the net for the coin flip once the second player arrives on court and one minute after the warmup to start the first point. That will strictly limit the pre-match time players spend in their new on-court chairs, redesigned along the umpires' chairs. The design of the on-court furniture was inspired by New York park benches and skyscrapers but executed with a concern for comfort and spectators' sight-lines. The 2018 US Open will be the first Grand Slam to utilize electronic line calling on all match courts. Each of the four show courts will have instant replay teams within the stadium, while data from outside courts will be analyzed in a central office located within the broadcast compound.